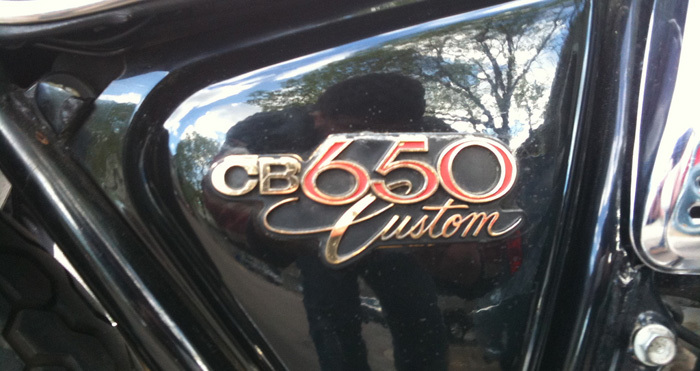 April 29, 2010 —Back in 2008, I got really interested in the idea of a Cafe Racer motorcycle. As far back as 2006 I’d been watching a lot of American Chopper, and though I rarely got too excited about the kinds of bikes they build, the whole notion of a proper motorcycle was something that really appealed to me — even before I bought my first scooter. That never really faded. With three years of scooter riding under my belt now, the motorcycle urge got a lot stronger this spring. Not just for me, but for The Mrs too. What we both wanted was not actually motorcycles specifically, but a new kind of riding that we couldn’t really do on scooters. We both wanted to expand our road wandering to a larger area and bigger roads. It isn’t that you can’t hop on a scooter and ride from here to Duluth, it’s that you can’t really do it comfortably. A motorcycle, on the other hand, is designed for exactly this kind of riding. With our mutual interests peaked. I started asking around about older motorcycles. I figured we’d maybe make a move at the end of the season. I stopped by Bluecat Motors because they specialize in older motorcycles as well as scooters. I’ve always appreciated their indiscriminate enthusiasm for anything with two wheels and a motor. Some bike shops can be snobby about what kind of bikes they deal in, but not Bluecat. On any given afternoon in their St. Paul shop, you’ll likely see a matte black Cafe Racer parked in between a candy-colored vintage Lambretta scooter and a 40 year old moped. They even host a Mods and Rockers event every summer. They’re the ultimate two wheel pluralists and that’s appealing for this kind of search because it means they’ve seen everything. 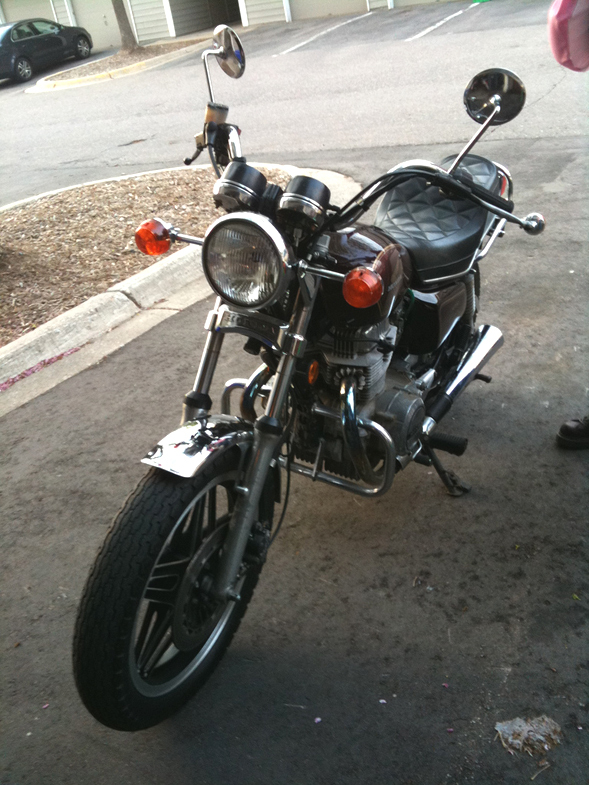 I asked Ryan (the proprietor) what kind of inexpensive but reliable older bikes I should look into for myself and The Mrs. His suggestion was that we’d likely be really happy with a japanese bike from the late ’70s or early ’80s and then gave me a crash course in evaluating old motorcycles. 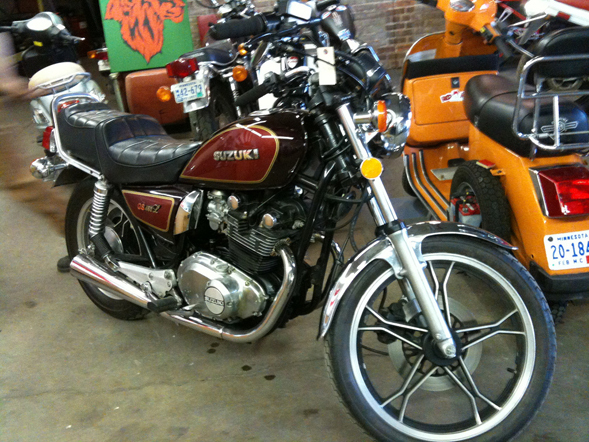 He even showed me a 1983 Suzuki GS450 that a lady had for sale on consignment. It looked perfect for The Mrs. Crap! What have I done? I guess looking leads to finding, so that’s what I get. I brought The Mrs by that weekend to look at the Suzuki. The price was right, it was perfectly clean and in immaculate mechanical shape. In the end, we actually tried to buy it. Too bad the lady who owned it got cold feet. This wasn’t discouraging though. We were committed now. The hunt was on in earnest.